This past September I found myself with the opportunity to cross yet another item off of my ever-growing bucket list. 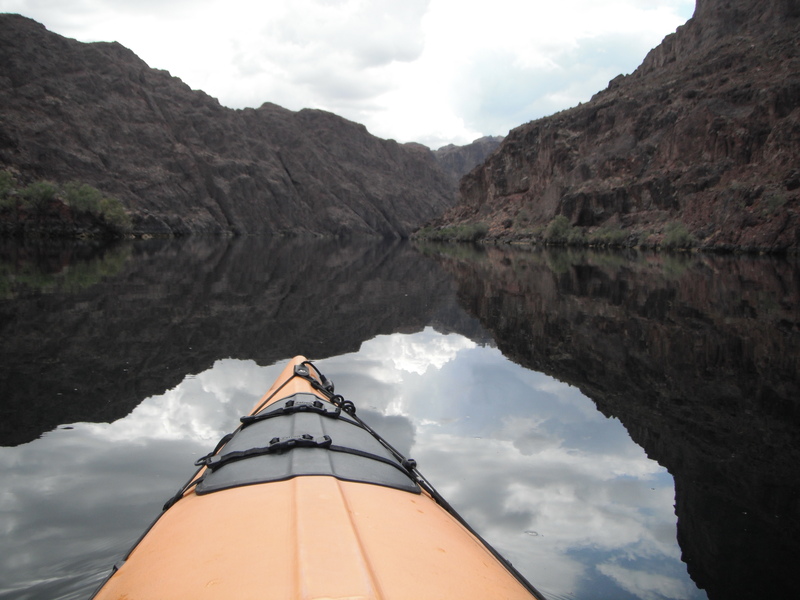 I had the opportunity to paddle part of the Colorado River. 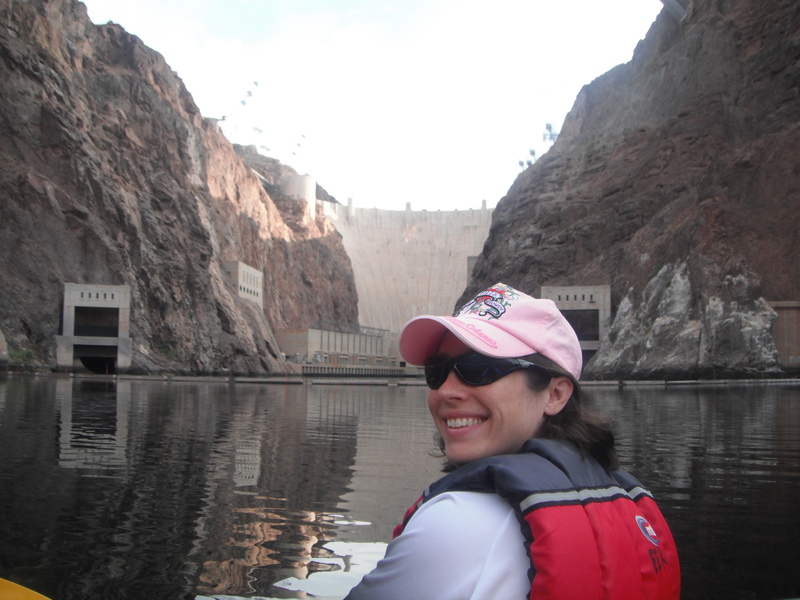 You see, paddling the Colorado has been something that I had always dreamed of doing. 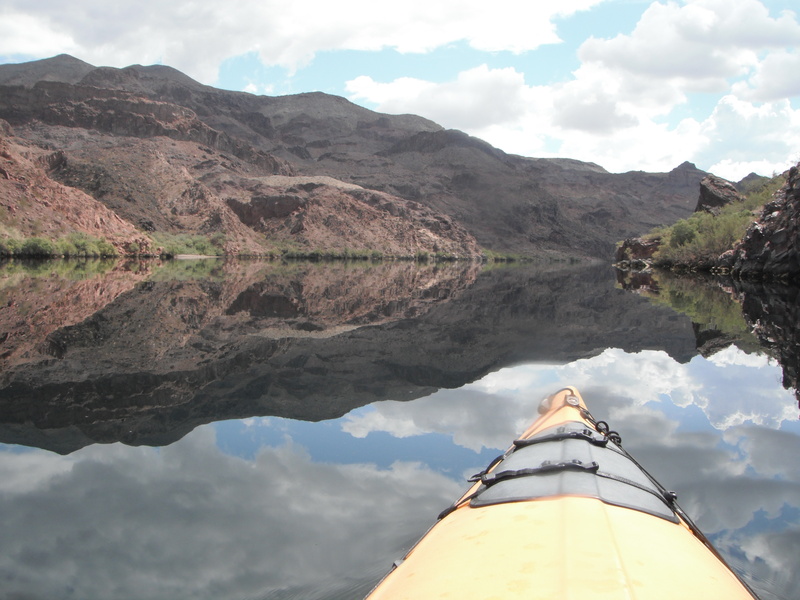 The stretch of river that I have often dreamed of paddling is the epic stretch of the Colorado River that runs through the Grand Canyon. 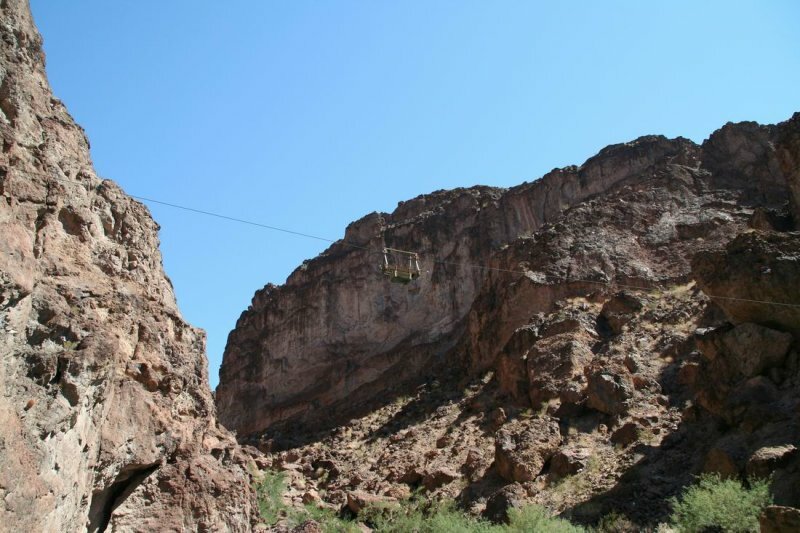 Such a trip would afford me the chance to experience some serious world-class white water and take in the beauty of the Grand Canyon from the floor looking up to the rim. I have never seen the Grand Canyon from this view-point. I wish this was the story of that paddle but it isn’t. I’ll have to paddle that stretch another time. However, I was not disappointed. 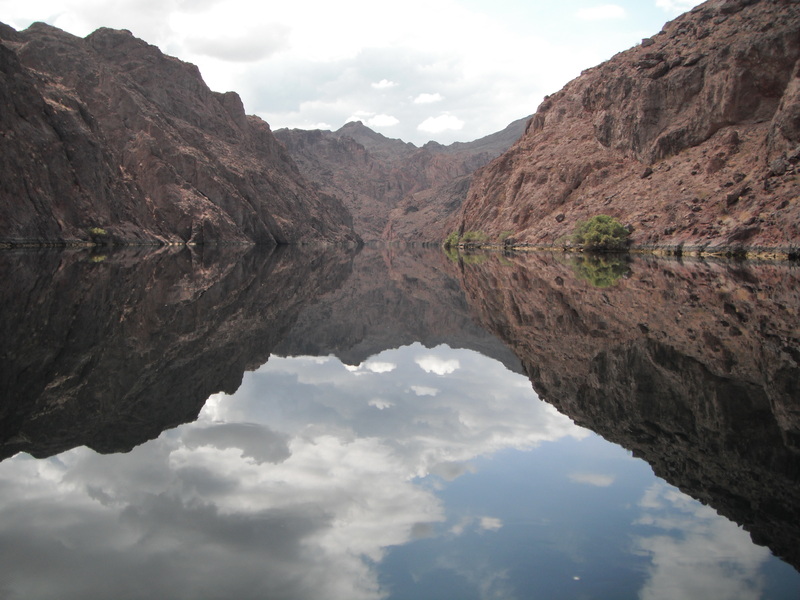 My trip took me through the beautiful Black Canyon on the Colorado River. 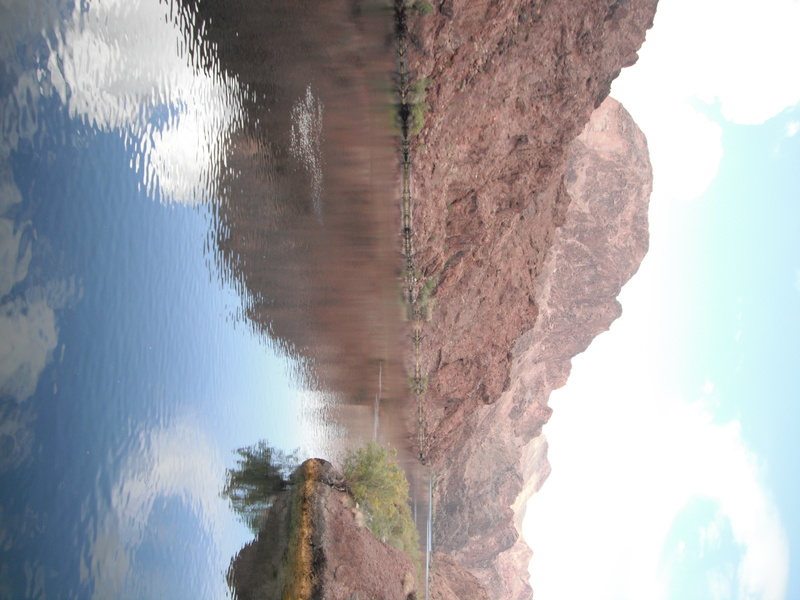 This is the stretch of river that flows from Lake Mead, created by the Hoover Dam, south towards Lake Mojave which was created by the Davis Dam. 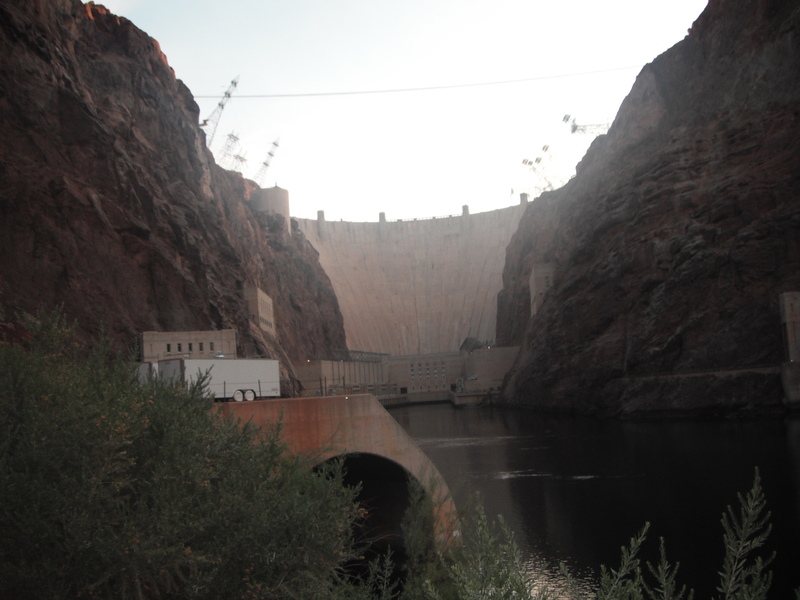 We would put in literally at the base of the Hoover Dam on the Nevada side of the river and paddle down river to our take out at Willow Beach on the Arizona side of the river. 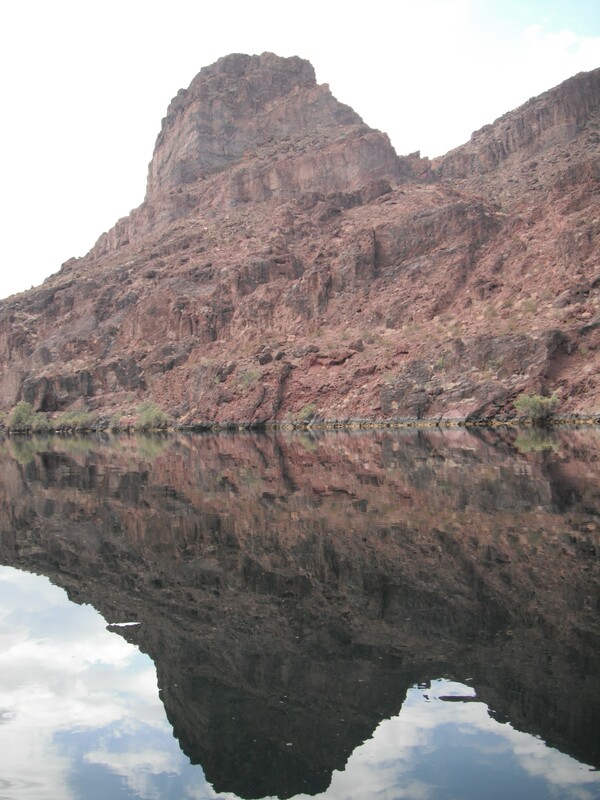 As we paddled, Arizona would be river left and Nevada river right for the length of the paddle. 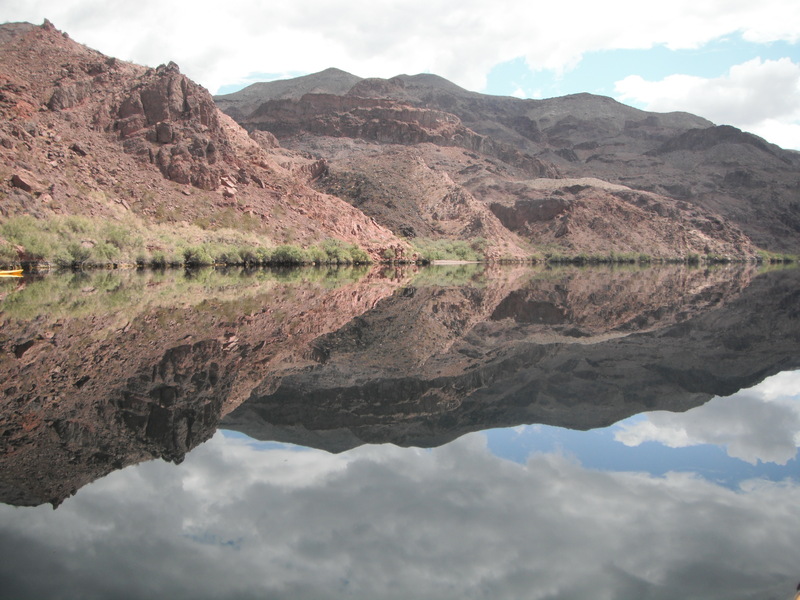 The water flowing between these two dams maintains a frigid year round temperature in the lower to mid 50° F. This is due to the depth of Lake Mead and the fact that the water the dams releases is released from the bottom of the lake into the river. 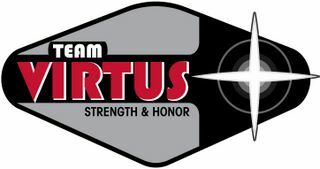 I would be making this trip with my beautiful wife, Lauren and one of my best friends Manny Garcia and his wife Shauna. My wife has limited canoe and kayak experience but I am pretty sure my friend and his wife had never been in a canoe or a kayak. 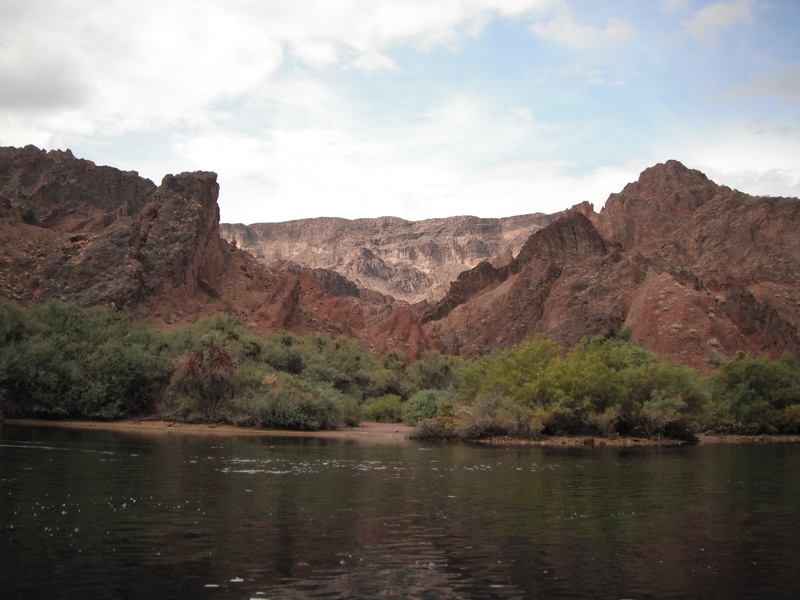 We decided it was best to join a guided trip down the river with Evolution Expeditions. They would be providing the boats, the paddles, life jackets, lunch, snacks, beverages, guides, and the local knowledge of the river. The guides picked us up outside our hotel at 5:30 in the morning. From there we had a 45 minute drive through Vegas to the Hacienda Hotel near the Hoover Dam to meet up with the other guide and the rest of our party. We met everybody else on the tour and it seemed like a good group. We all piled into one of the vans and headed to the Hoover Dam to our put in. We talked with the knowledgeable guides and each other and soon had built a sense of camaraderie and knew the day would be a great one. On the way to the river we saw a big horned sheep on a mountain side up from the road. This was the first time I saw one in the wild and was excited but unable to get a picture due to the speed of travel on a bumpy road we were on. I was assured by the guides that we’d see plenty of them along the river as they regularly came down to water on the Colorado River since we are surrounded by desert. 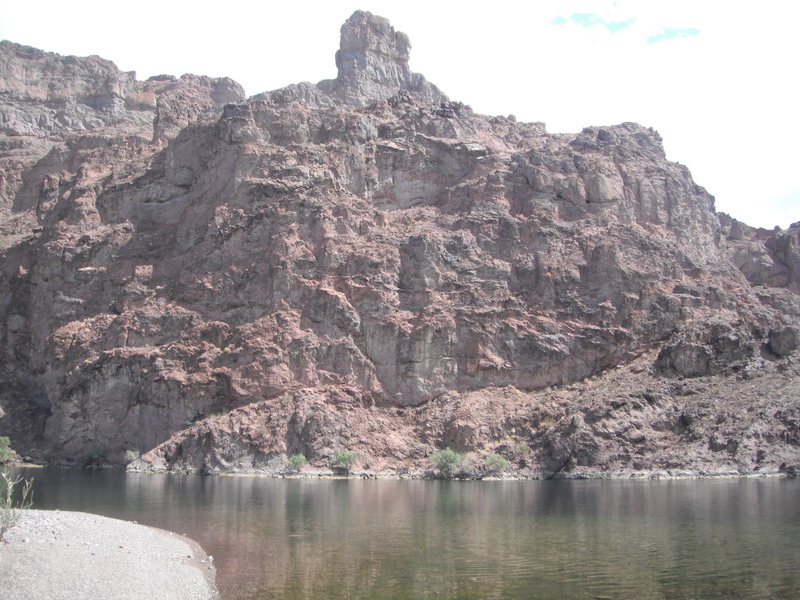 They told us we might get see bald eagles, peregrine falcons, big horn sheep, maybe a rattle snake, and much other wildlife since they rely on the Colorado River for water in this arid region. We carried the boats down a ramp and over some rocks and into the river. We got a quick how to paddle and what not to do lecture and then we launched our crafts into the Colorado. We took a few minutes to paddle around and familiarize ourselves with the Prion Kayaks. Manny and Shauna were in a tandem as were Lauren and I. Everybody else had opted for solo kayaks. 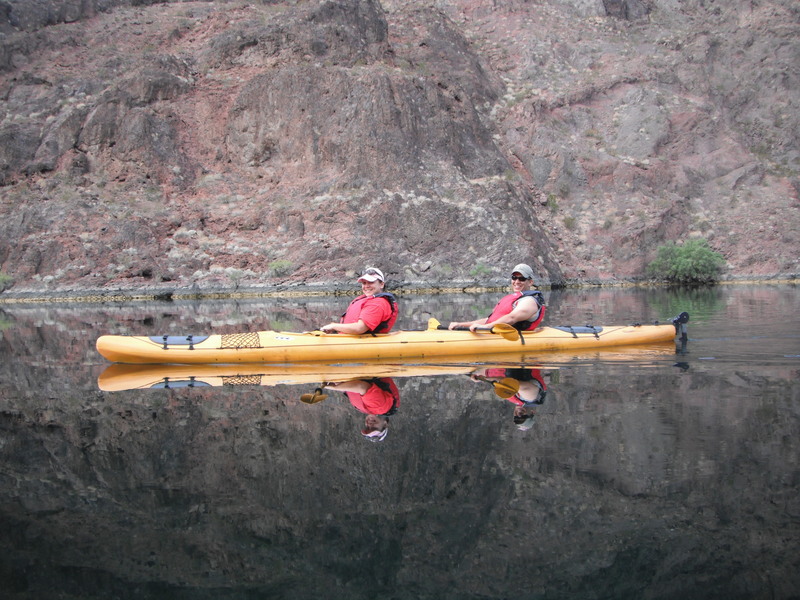 As we paddle around, the guides informed us that our marriages would be tested today since we chose to paddle in tandem or “divorce boats” as they are known in the business. We laughed and made a vow to get along at all costs. 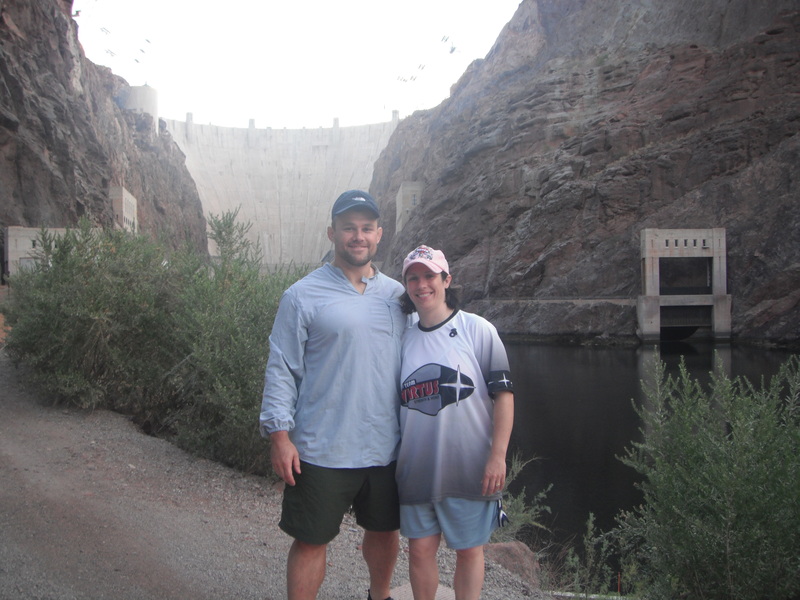 We posed for a couple of “dam photos” and soon were headed down river. Check out that walk way...would you walk it? Here are a couple of pictures that I found online but didn’t actually take myself. The first one shows a longer stretch of the walkway and the second one shows the actual gondola that the dude used to cross the river. A stretch of the sketchy walkway along the cliff face. We continued down river a bit when we were directed to beach the boats on the right side of the river. We had arrived at our first stop of the trip, the Sauna Cave. 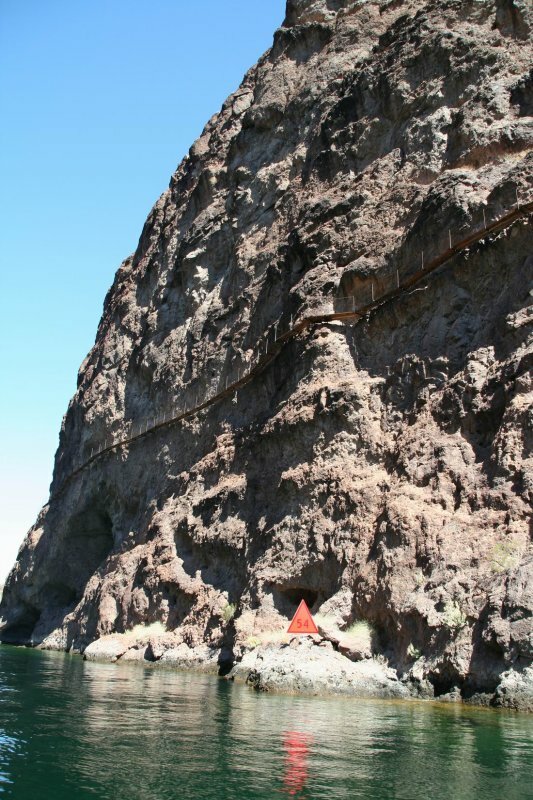 This is a man-made cave that was drilled out back when the Hoover Dam was being built. 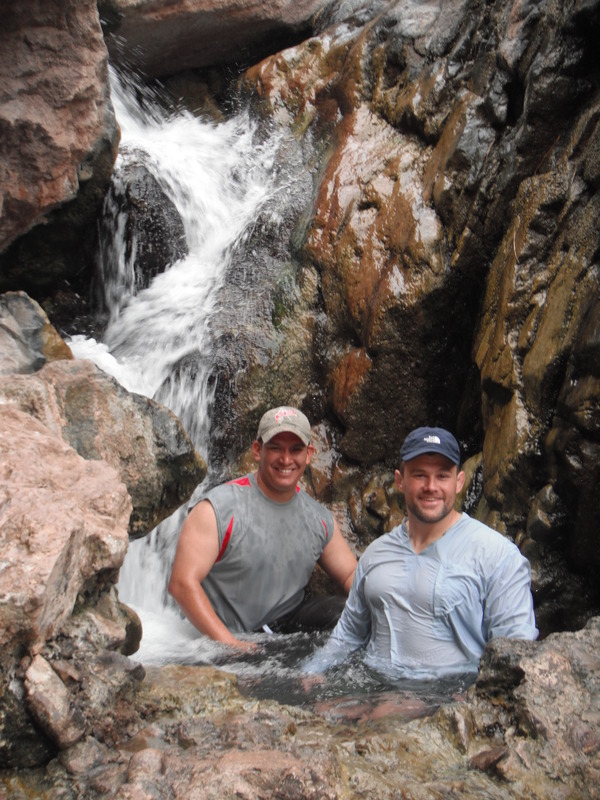 They hit a natural hot spring and the cave is now full of hot water and has a temperature of around 130°F. 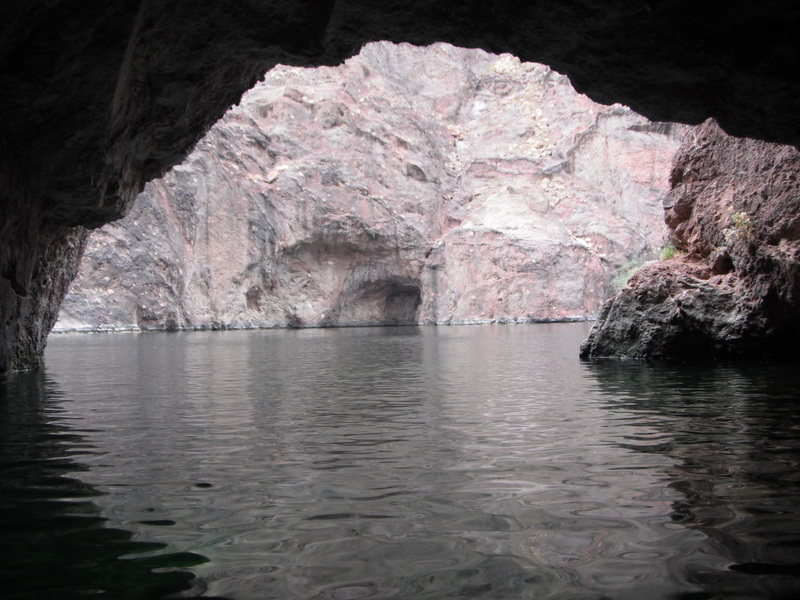 We stripped down to our bathing suits and got ready to climb up to the cave. As we disrobed I made the joke about going in the cave naked. The people we were with seemed all for it and ready to participate. I quickly backtracked and announced I was keeping my suit on. After a few minutes of thought, it hit me…the rest of our group was made up of free loving hippies; seriously cool hippies from Alaska. Not the fake hippies you see nowadays but grownup hippies from back in the day. I couldn’t believe I didn’t pick up on it earlier. They were laid back and really cool, down to earth people. Luckily for all, everybody kept their clothes on. We left our lights off and climbed through the hot water to the cave mouth. You could see steam flowing from the cave and feel its hot, moist breath on your skin. We walked single file through the cave, our sense of touch our only guide. The cave bent a bit to the left and soon we were in total darkness. Wet, Hot, Darkness…With a bunch of cool, free-loving hippies. We sat ourselves along the back of the cave and enjoyed the experience. Soon the rest of our group started to “ouhmmm” all together and chant like a bunch of Tibetan monks. At first it was cool and I even joined in for a bit. But they kept on and on and on with the chanting. I could feel their chants reverberating throughout my entire body. The chants seemed to grow louder the longer it went on. It was cumulative and growing in intensity….Louder, Louder, Louder. My insides were vibrating and I was tingling all over. I get that they were enjoying it and possibly they felt something spiritual by doing this but after 5 or 10 minutes of chanting I was ready to experience the cave in silence. The silence never came and finally it was time to head back to the river. After our sweaty visit to the cave we jumped into the frigid river to cool off. It felt so good and we enjoyed our quick swim before loading back into the kayaks and continuing down river. Warning – Naegleria fowleria, an amoeba common to thermal pools, may be present and could enter through the nose causing a rare infection and death. Do not dive into pools, splash water, or submerge your head. I was surprised the guides hadn’t mentioned this fact earlier in the trip. There had been a couple of deaths caused by this amoeba already in 2011 (not in Las Vegas but down south in hot, stagnant ponds). As we prepared to hike up the canyon to the hot springs I asked them about the amoeba thing. They played it off and said it was very rare and not likely to happen. But we probably should not dive or submerge our heads in the water. I then asked about the warm waterfall I was just sitting under. And found out that this was the runoff from the hot springs and it probably wasn’t a good idea to get the water in or around your nose or ears. Seriously? I was just sitting under the falls and letting it cascade down my head and shoulders. Well, too late now. The damage had already been done. (For the next 3 or 4 weeks I constantly blew my nose and thought I was going to die from amoeba infection, but the fact that you’re reading this proves I did, in fact, survive. Whew!) 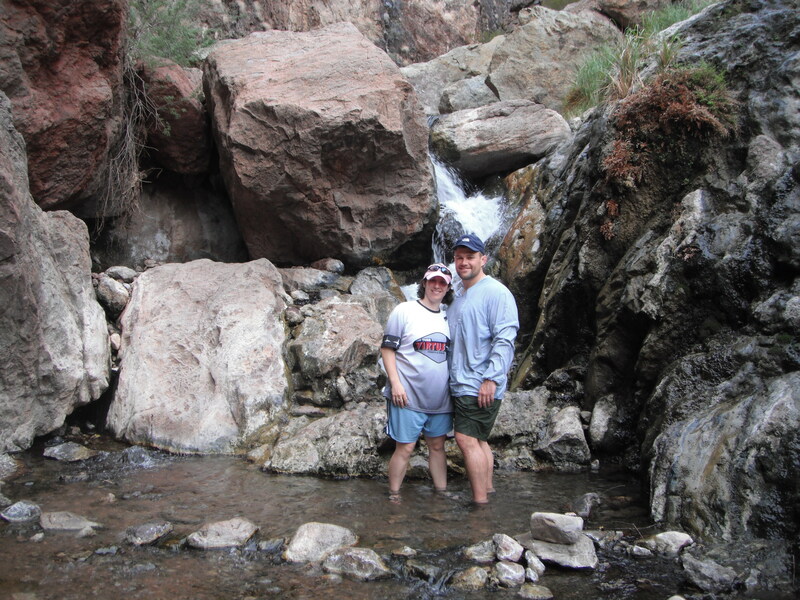 We hiked up the canyon and waded and sat in numerous hot springs. This was my first time in a hot spring in nature and thoroughly enjoyed the experience. The guide told us how the Native Americans used to come here for the healing abilities of the springs and how they were sacred to them hundreds of years ago. I haven’t researched their claims, but the hot springs were surrounded by desert. 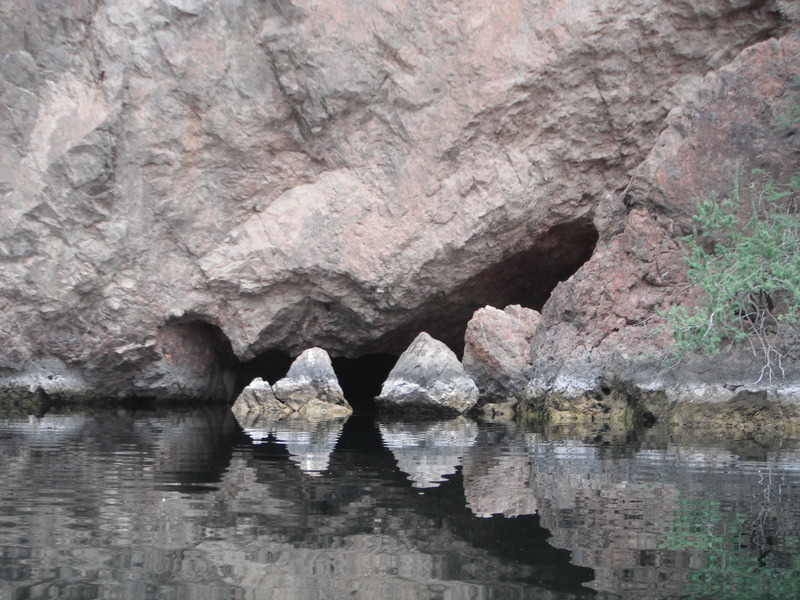 I am sure the Indians came to the river for water, but to sit in the hot springs when it was 100°F or higher? Maybe? I enjoyed their story and decided not to ruin it by possibly disproving it with some research. 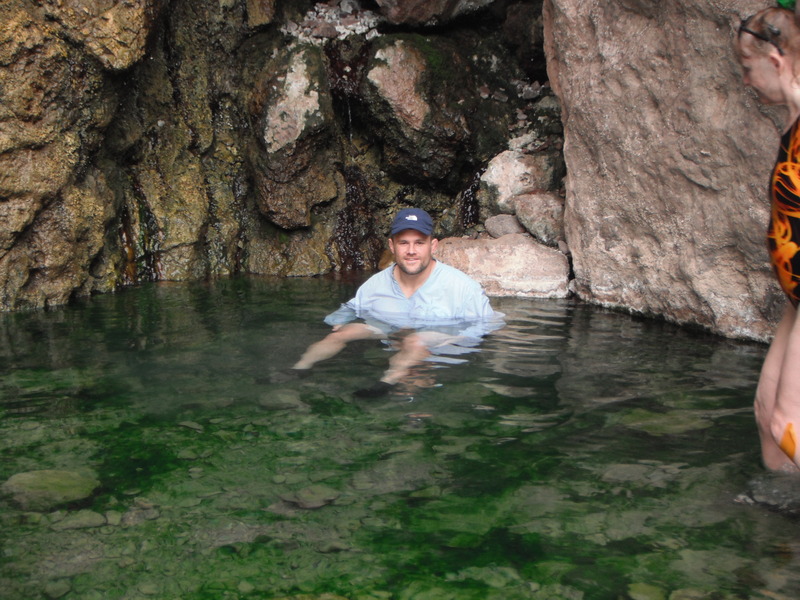 To me, it is probable that people once came here for the healing properties of these magical hot springs. Did it heal all of my aliments? No, I am afraid not. But it did feel pretty damn good to sit in the hot springs and relax. If you haven’t enjoyed a natural hot spring, do yourself a favor and visit one. 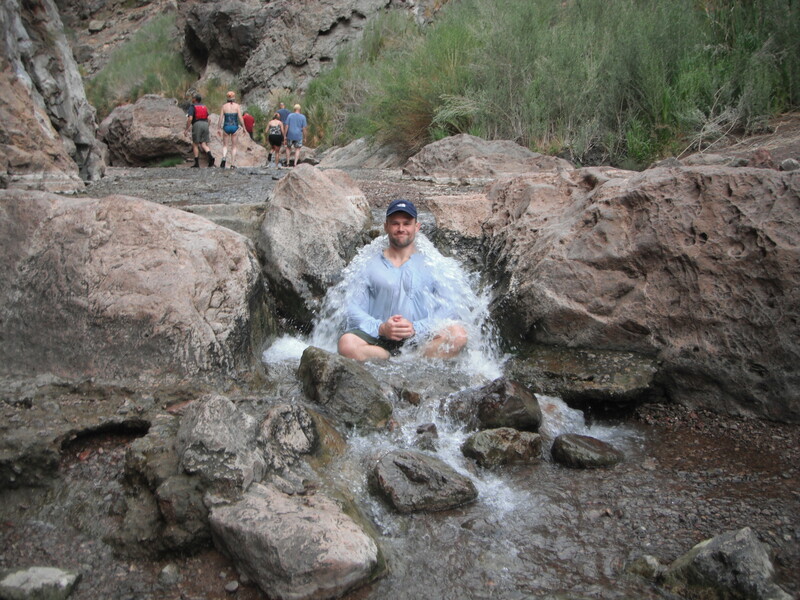 This was the hottest spring, I was the only one to sit in it. It felt so good. "Did we just sit in amoeba infested water?"..."YEAUPPP!!!" We hiked back to the river and headed down stream in our “yaks”. 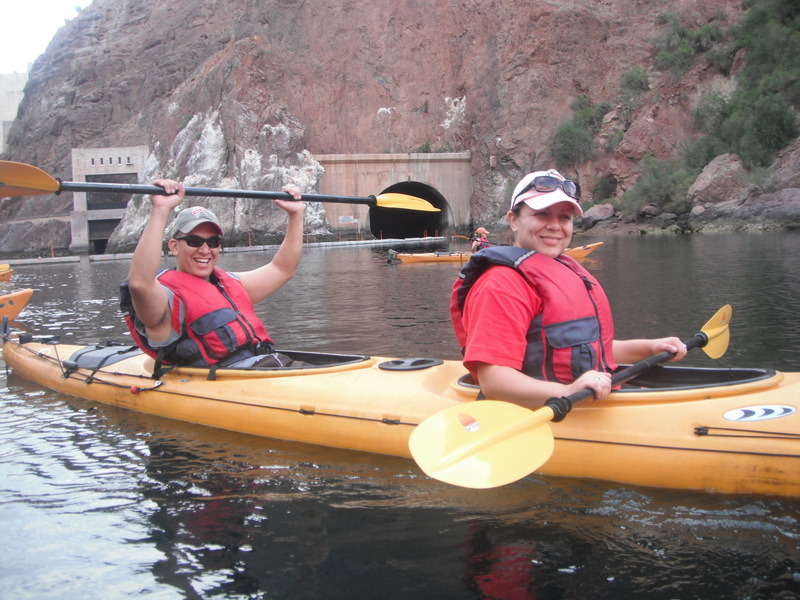 We paddled leisurely and enjoyed the spectacular weather and the breath-taking views. 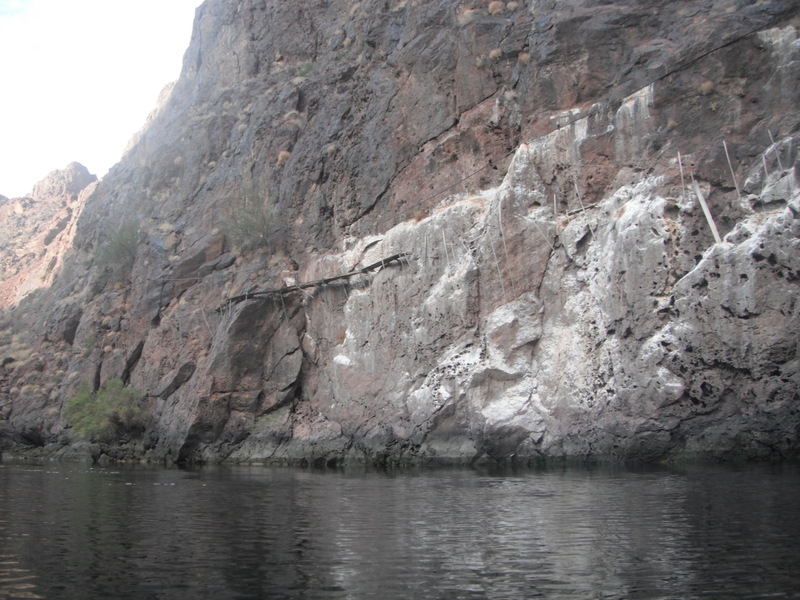 Our next stop was at the cliff jump. 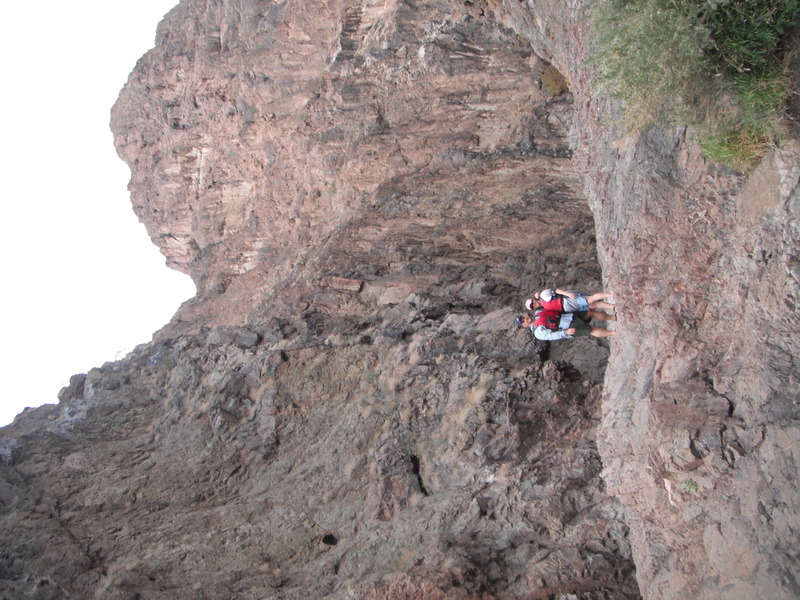 We had some granola bars for a snack and climbed along a cliff face and out on a ledge. 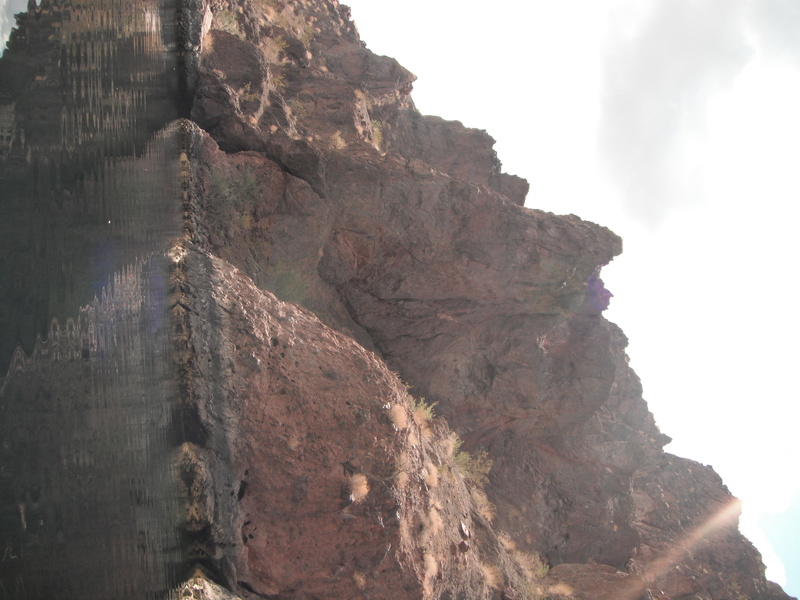 We took turns jumping off of a 30 foot cliff into 50° F water. 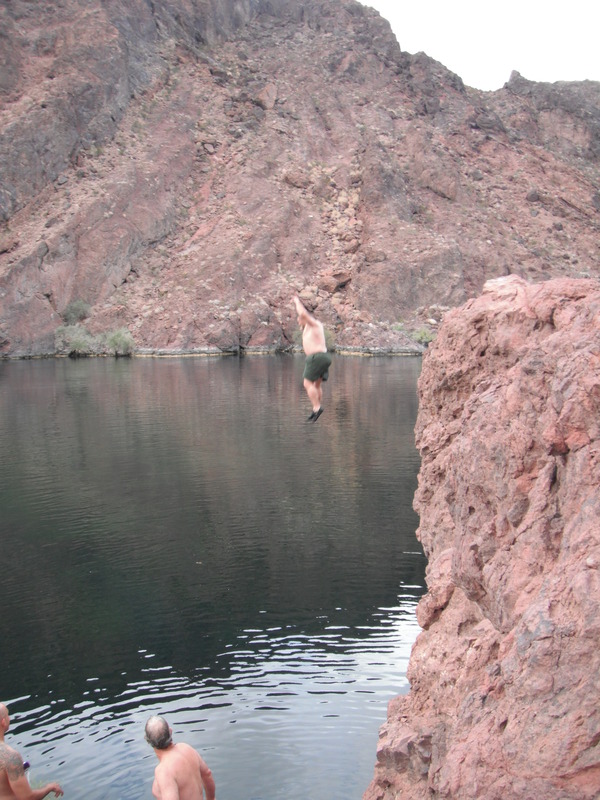 I’ve cliff-jumped plenty but never into the Colorado RIver. It was a great time. The ice-cold water literally took your breath away on the first jump. It was every bit as cold, if not colder than, the Mississippi in early April. 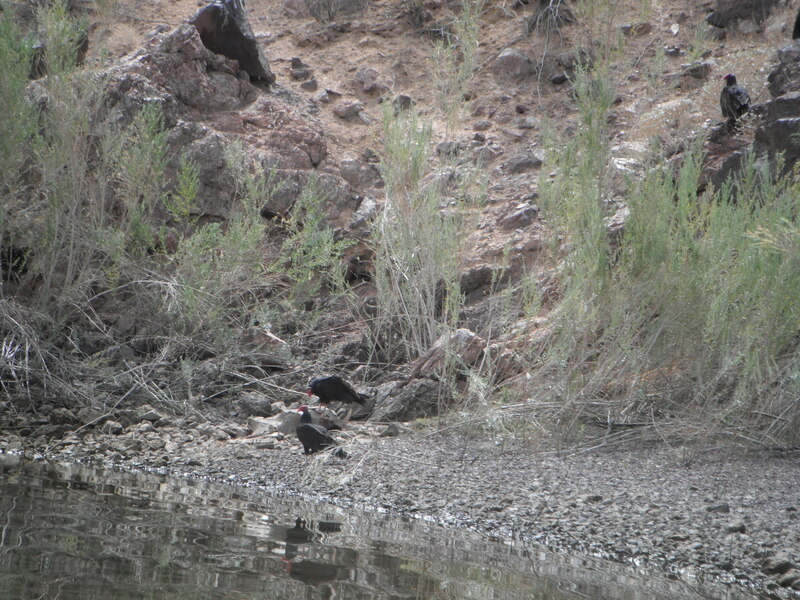 Look closely and you'll see the vultures eating the only big horn sheep we saw on the river. A vulture strikes a pose in an attempt to scare us away. We saw a whole wake of vultures in this horaltic pose. 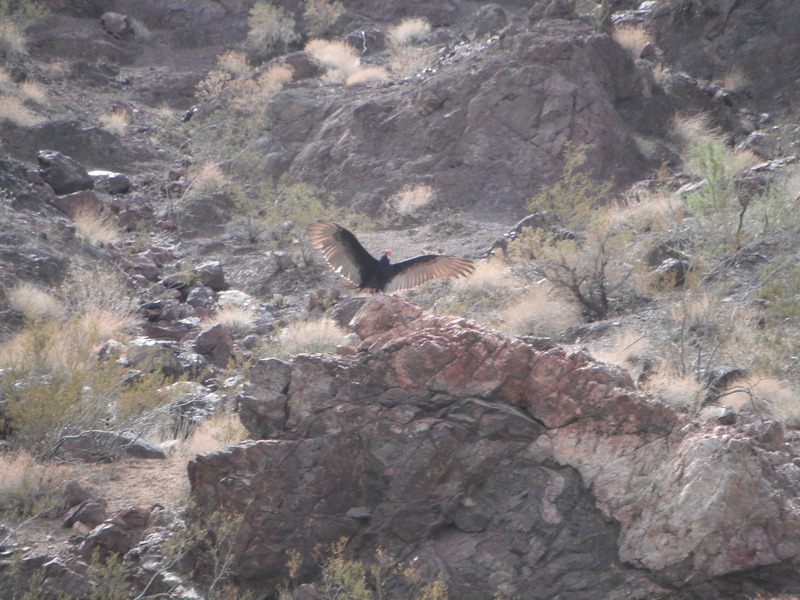 As we neared the beach with the dead sheep, we looked at the hillside and saw 7 or 8 vultures in this pose. It is believed the pose is to dry their wings, heat their bodies, or bake off bacteria. Scientists are still studying the reasons for this pose. I have some thoughts on it…It was in the 90’s so I think the vultures were warm, they had to be dry (we were in the desert), so I guess maybe they decided to bake off bacteria as we got close to the beach where they were feeding. My theory is maybe, just maybe they use this pose to look larger than they are in an attempt to scare off predators or other scavengers (or in this case the big ugly creatures in the kayaks). Whatever the reason it was really neat to see. One started the pose and then they all copied the pose as it spread across the hillside like dominoes being knocked over. I have never seen more than 1 vulture in this pose at a time. It was really cool. After lunch, we paddled down the river. I think some of our group was ready to get off the river. We had a long stretch of very slow-moving water to paddle before reaching our takeout. 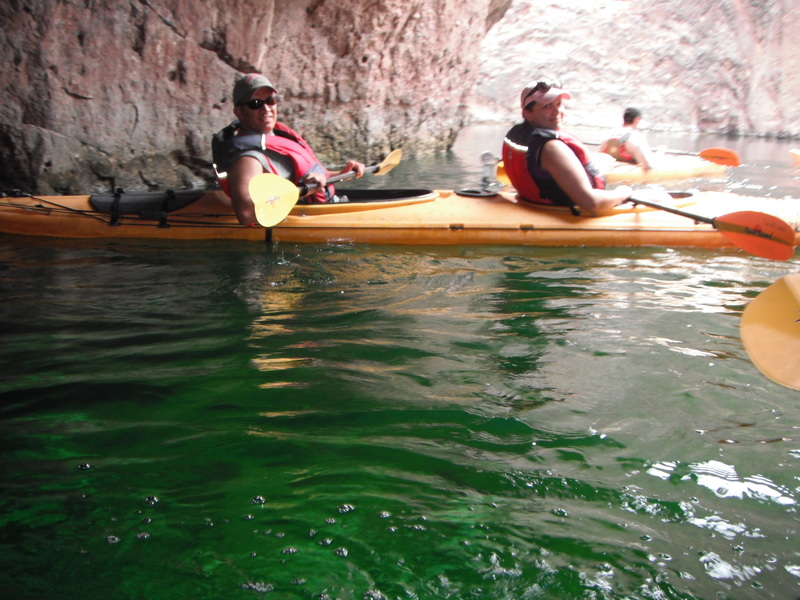 We broke this long stretch of paddling up by having water fights with water tubes and our paddles. I literally almost sank Manny and Shauna’s kayak by scooping water with the blade of my paddle and throwing it into their boat. Their inexperience in a kayak and using a kayak paddle was my savior. I had a definite unfair advantage as I threw gallons upon gallons of icy water into their boat. 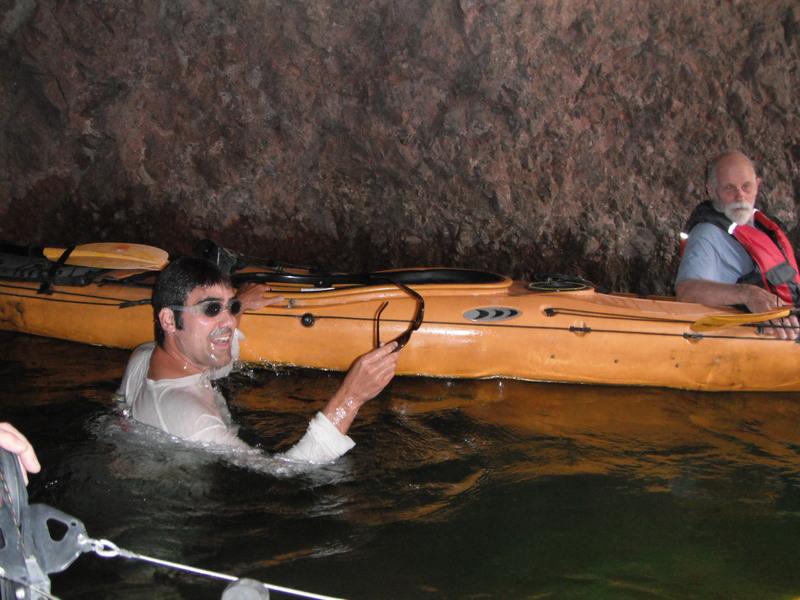 Eventually, Manny called a truce and the Lamb kayak was declared the winner. He then spent the next 10 minutes sucking water out of his boat with his water tube. It was a good time and made this stretch go a little faster for those ready to call it a day (I could have paddled all day and into the night, I was truly enjoying the experience). Our last stop happened to be inside a cool cave named, “Emerald Cave”. 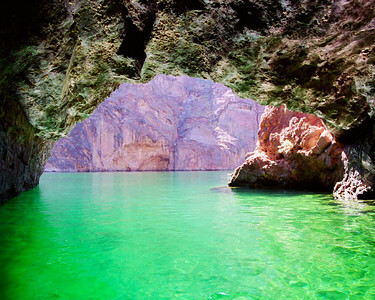 It got its name because with the right lighting conditions the water is a fabulous, deep, emerald-green color. How Emerald Cave can look in the right conditions. He didn't discover why the water was green but he did find Shauna's sunglasses. We continued downriver and enjoyed the scenes. We saw double-crested cormorants, a pair of peregrine falcons, and blue herons. As we neared Willow Beach, we passed Willow Beach National Fish Hatchery. They raise and stock trout in the rivers and lakes in the region. They also raise razorback suckers and bony tail chubs and restock thousands of these fish each summer into their native waters, the Colorado River. We continued down river and spotted our takeout in the distance. We really dug in and sprinted to our takeout. It was a yet another competition that the Lamb boat would win. The end of a wonderful day on the river...Willow Beach, Arizona. We had finished our trip and had a great time on the river. An experience that we will never forget. We had a great time with great guides. They were experienced, knowledgeable, and had great personalities. If you are ever in the area, even just for a short visit you are doing yourself a disservice if you don’t make time for this trip. 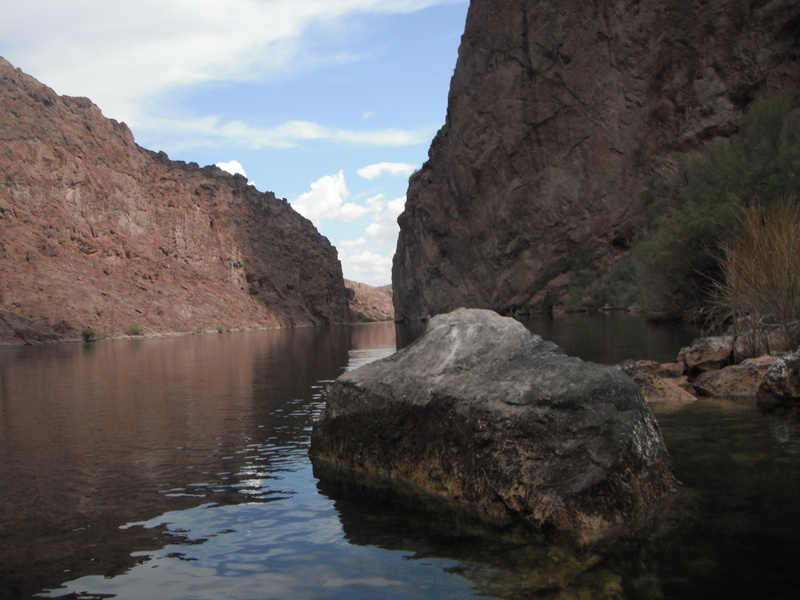 If you are in Las Vegas for business or pleasure take a break from town and head to the river. You will not regret it, and you’ll create memories that will live forever. Here are a few more pictures that I couldn’t fit into the report. Check them out.